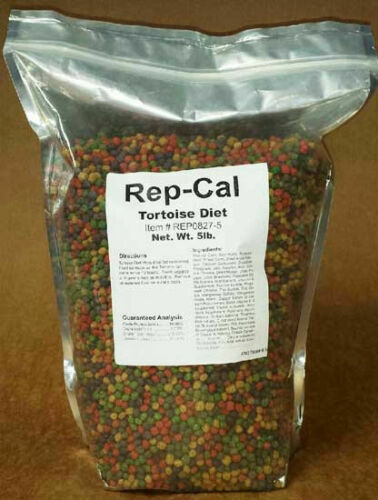 Rep-Cal Tortoise Food is formulated to ensure proper growth and health by providing complete and balanced nutrition. It is a veterinarian recommended food containing natural plant and fruit ingredients tortoises love and provides the 100% complete daily nutrition they need. Ground Corn, Soy Hulls, Soybean Meal, Corn Gluten Meal, Dried Apple Pomace, Wheat Germ, Calcium Carbonate, Dicalcium Phosphate, Salt, Ascorbc Acid, Cholin Chloride, Dried Mango, Dried Papaya, Dried Strawberry, Vegetable Oil, Methionine Supplement, Vitamin E Supplement, Spirulina, Ferrous Sulfate, Potassium Chloride, Zinc Sulfate, Zinc Oxide, Manganese Sulfate, Manganous Oxide, Niacin, Copper Sulfate, D-Calcium Pantothenate, Biotin, Vitamin B12 Supplement, Vitamin A Acetate, Riboflavin Supplement, Pyridoxine Hydrochloride, Sodium Selenite, Thiamine, Mononitrate, D-Activated Animal Sterol (Source of Vitamin D3), Menadione Dimethyl-pyrimidinol Bisulfite (Source of Vitamin K) Cobalt Carbonate, Inositol, Ethylenediamine Dihydriodide, Folic Acid, Artificial Color, Natural Flavor.